A new book co-edited by FNI Senior Research Fellow Tor Håkon Inderberg presents case studies showing that climate change is as much a problem of development as for development, with many of the risks closely linked to past, present and future development pathways. Development policies and practices can play a key role in addressing climate change, but it is critical to question to what extent such actions and interventions reproduce, rather than address, the social and political structures and development pathways driving vulnerability. The chapters in the book emphasise that adaptation is about much more than a set of projects or interventions to reduce specific impacts of climate change; it is about living with change while also transforming the processes that contribute to vulnerability in the first place. To what extent are development and aid interventions contributing to, or countering, current development pathways that are based on fossil-fuel-driven economic growth? Are adaptation measures merely incremental adjustments to ‘development as usual’, or can they influence current development pathways in ways that bring about fundamental transformations and paradigm shifts? 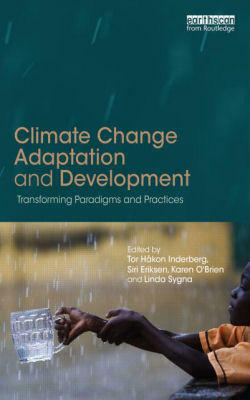 Citation: Tor Håkon Inderberg, Siri Eriksen, Karen O'Brien and Linda Sygna (eds): Climate Change Adaptation and Development: Changing Paradigms and Practices. London, Routledge, 2015, 295 p. ISBN 978-1-13-802598-1.